North Carolina lawmakers’ late June quick-fix to the voter ID law was not enough to head off the legal challenge to photo ID as a requirement to vote, Superior Court Judge Michael Morgan said in an order  issued on Wednesday, allowing the pending state court voter ID lawsuit to proceed to trial. Morgan’s ruling comes a month after lawmakers asked for a dismissal of the case, arguing that recent legislative changes rendered claims against them moot. Under the law as initially passed in 2013, voters at the polls must present a photo ID before casting a ballot beginning in 2016. Acceptable IDs include a free identification card voters can obtain at Division of Motor Vehicle offices throughout the state. To get that, residents still need to present two forms of identification, proof of residency and proof of a valid Social Security Number. Voters appearing at the polls without any photo ID can still cast a provisional ballot, but that would be counted only if they then appeared at the county board with acceptable ID or other documents proving their identity, or completed an affidavit attesting to a sincerely held religious belief that prevented them from having the necessary ID. With the changes adopted in late June, voters lacking acceptable photo identification can swear to some reasonable impediment in getting that ID, provide proof of residency and a valid Social Security number, and then cast a provisional ballot, which would be counted with nothing further required. Revisions to the voter ID requirement surfaced to the surprise of lawmakers on both sides of the aisle in June, proposed as a last minute joint compromise to House Bill 836  just as state and federal lawsuits challenging the 2013 election law chanages were heating up. Several of the Republican party faithful ridiculed their own for caving on voter ID, one of the signature provisions of their 2013 voting law. 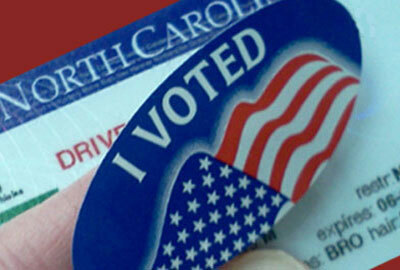 “North Carolina is the first state to lose a voter photo ID case and the Republicans in the state legislature were the deciding factor,” the conservative Civitas Institute said in a statement. But lawmakers had heard plenty from voters about photo ID, Republican Rep. David Lewis said during debate on the bill, and wanted to ensure that every voter in the state who needed an ID could get one and could vote. Getting an acceptable ID had proved to be neither free nor easy for many voters. In sworn statements submitted in the state case, several recounted continued difficulties in getting identification needed even for the so-called free card supposedly offered at the DMV, reporting that the agency was charging for the cards and that staff there were providing them with incorrect or inconsistent information. In proceedings before Judge Morgan last month, lawmakers argued that they were well within their rights to pass a bill intended to cure defects of the voter ID law while the lawsuit was pending, and added that language similar to that in their “reasonable impediment” provision had already been sustained as constitutional by courts elsewhere. But plaintiffs in the state case contended that the changes did not repeal or eliminate the requirement that a voter present a photo ID before casting a ballot in person – a requirement not included as a qualification to vote in the state constitution. They added that the law as amended still did not address the disparate impact a photo ID requirement had on minority voters and suggested that “reasonable impediment” language could easily be removed next session prior to November 2016 elections. The latter suggestion stemmed in part from remarks by Rep. Michael Speciale, who told the Beaufort Observer in late June that he’d be doing just that. “You may rest assured that I fully support requiring a photo ID and once this DMV mess is straightened out I will, if no one else does, introduce a bill to scrap the ‘impediment’ exception,” Speciale said, referring to the allegations that DMV was charging voters for the “free” voter ID. In his order issued yesterday, Morgan held that the “reasonable impediment” provisions did not rise to the level of a repeal of the voter ID requirement needed under state law for the claims challenging such a requirement to be held moot. In a separate order, Morgan allowed  the challengers to amend their complaint to assert an “as applied” constitutional claim, alleging that the state engaged in a campaign of misinformation and miseducation about the new voter ID law, continuing a pattern of intentional discrimination against African-American voters. The judge also agreed to stay further proceedings in the case until after the 2016 presidential primary so that the parties can assess the implementation of the voter ID law, including the “reasonable impediment” provision, and its impact on voters. How Morgan’s orders yesterday affect the voter ID challenges pending in federal court remains unclear. Those cases went to trial before U.S. District Judge Thomas Schroeder in late July on all claims against the 2013 election law changes but voter ID, which Schroeder carved out after lawmakers enacted the “reasonable impediment” provision. A trial on the voter ID claims there has been held in abeyance while both sides discussed how to proceed. In a joint report to the court filed last week, the parties said they had been discussing a possible resolution of those claims in light of the changes to the law and asked for additional time to continue those negotiations.